These chairs are being sold as seen. 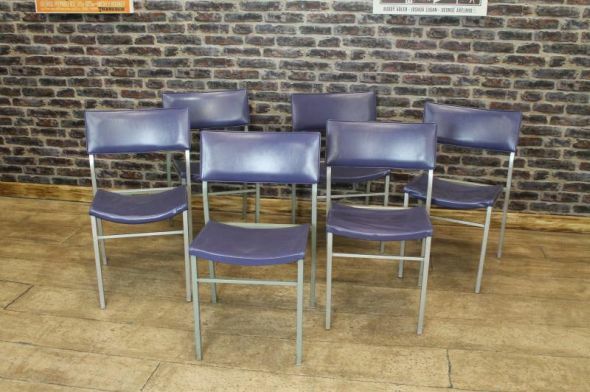 A fantastic opportunity to purchase some really lovely vintage restaurant chairs. With a grey painted framework (which does have some wear and tear), the seats are upholstered in a dark blue/purple faux leather material. These chairs are extremely comfortable, and are being sold individually. We do have a large amount available, so they are ideal for any small or large café, bistro, restaurant etc. Please be aware that these items are vintage, so they will show signs of wear and tear. The items are on display in our large and extensive showroom which holds many antique and vintage items. Please note that this listing is for one chair, but we do have more available.